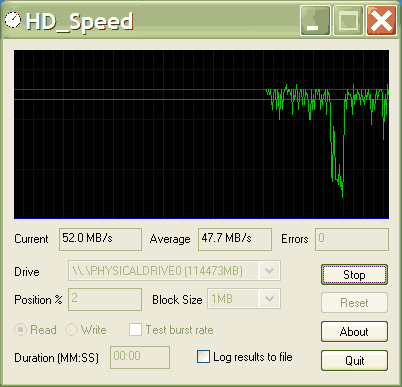 HD_Speed measures both sustained and burst data transfer rates of your media including hard disk, flash, CD/DVD-ROM, and floppy with real-time graphical display. How to extract: Download the ZIP package and extract to a folder of your choice. Launch HD_Speed.exe. This program really helped me out today by showing a "high speed" flash drive really wasn't. Negatively, it wants to erase a drive to run a write test for some reason. Still, a great diagnostic program with an easy to understand output. You need to start this by "run as administator" in order to see all the drives. You can set that property in the shortcut properties if you wish. yoi.. that test this software. Luis, Not sure what you're doing but it recognizes NTFS fine for me. By the way, NTFS is a file system not a drive type. Also, this tool lists physical devices as well as drives by letter which makes me think it might be able to test non-windows partitions as well though I haven't tried it. This utility don't recognize NTFS drives.